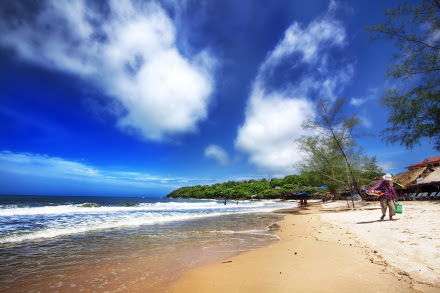 Stretching over incredible 400 square kilometers, including forests, Angkor Archaeological Park contains what remains of several capitals of the Khmer Empire from the 9th to the 15th centuries. 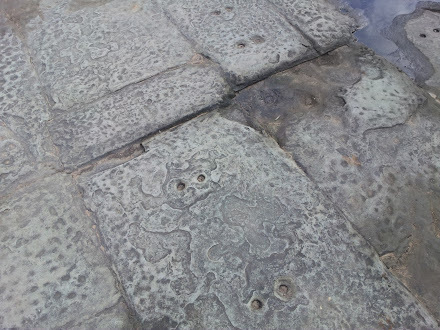 These are the remains of the largest pre-industrial city in the world. The most famous buildings are the temple of Angkor Wat and, at Angkor Thom, the Bayon Temple with its countless sculptural decorations. In the 12th Century AD, the Khmer Empire ruled most of what is now Southeast Asia. 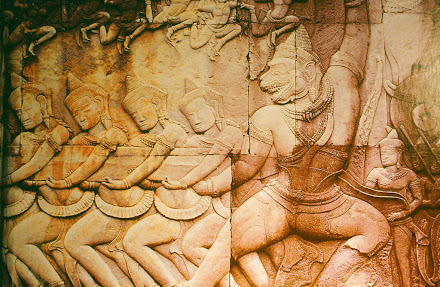 King Suryavarman II built the temple of Angkor Wat at the height of his empire’s glory. 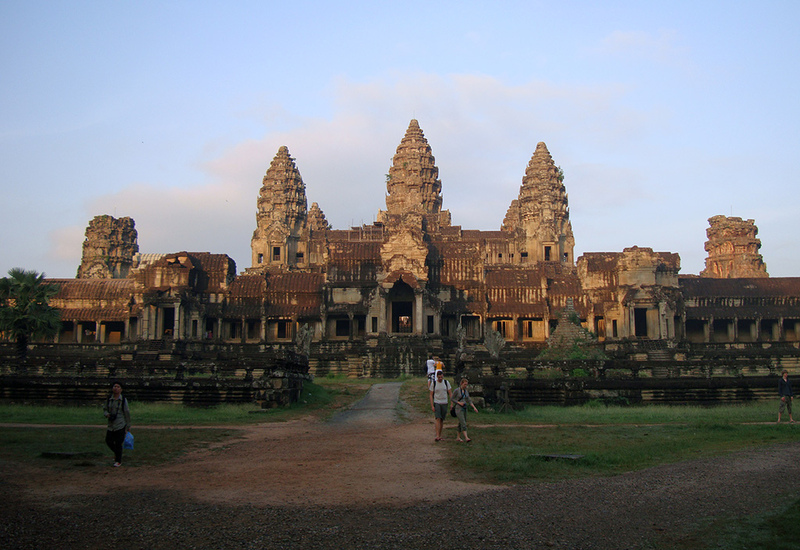 But within 200 years, the powerful Khmer civilization mysteriously collapsed. And the jungle swallowed the magnificent Khmer temples and cities. Only in the 19th century French explorers rediscovered the ruins. In 1992 Angkor Archaeological Park was declared a UNESCO World Heritage site. Prepare your discovery of Angkor Archaeological Park by reading one of the best guidebooks. Download it here for free: The Monuments of the Angkor Group by Maurice Glaize has been published in 1944 in Saigon, republished in 1948 and again in Paris in 1963. 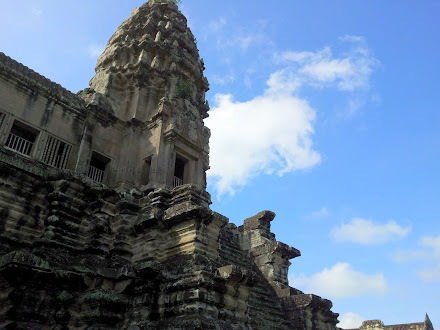 A good overview of Angkor Archaeological Park you get on Wikitravel. 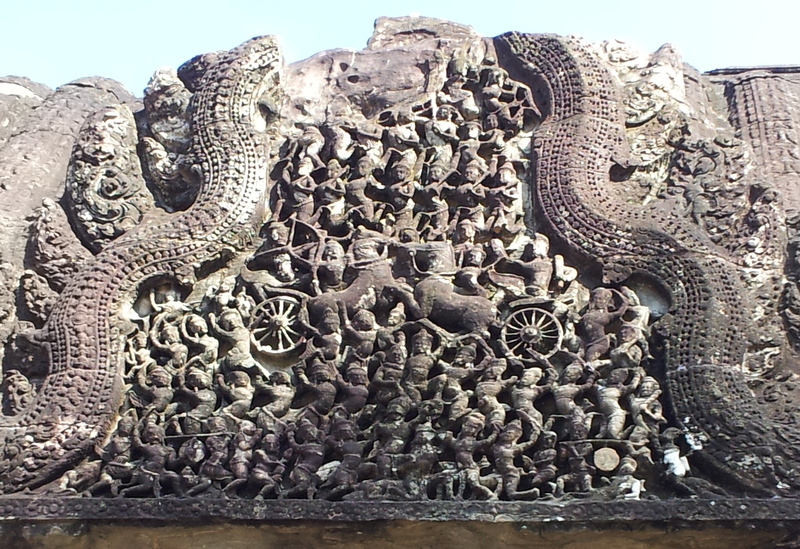 Helpful is also the chapture about Khmer Architecture on Wikipedia. Helpful is this Map of Angkor Thom and Angkor Wat. 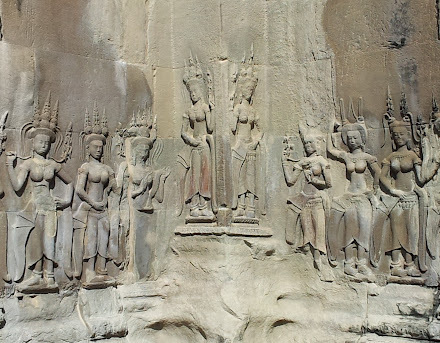 Angkor Wat is home to one of the world’s most fascinating archaeological mysteries: Why do images of women dominate the largest religious monument on earth? 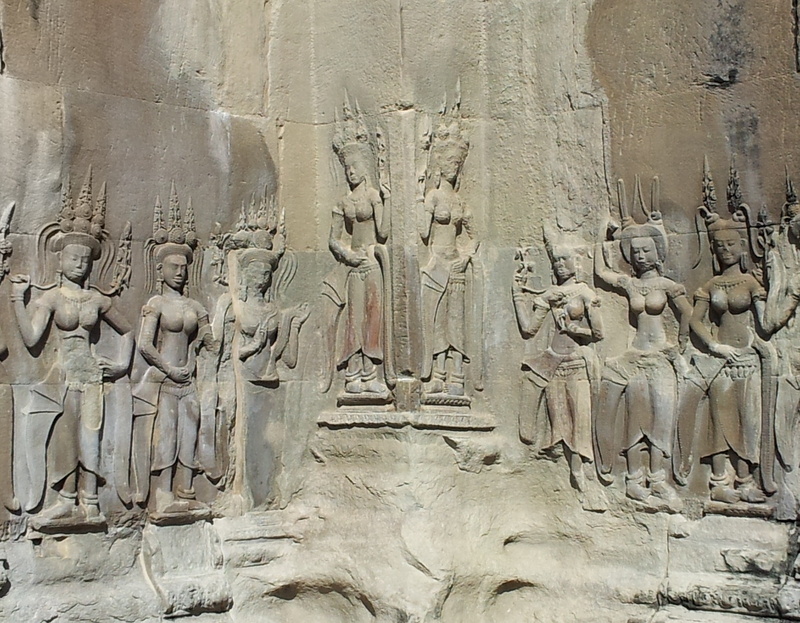 You find more than 1700 women realistically rendered in stone. devata.org is deicated to these questions. Women in the inner gallery of Angkor Wat - two out of more than 1700 women carved in stone. What did these women mean to the Khmer rulers, priests and people? 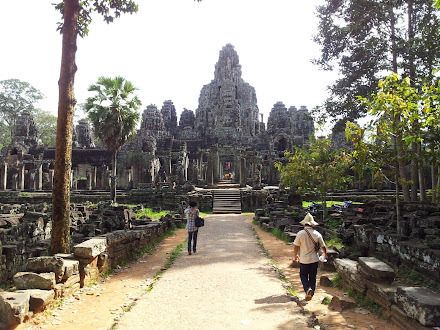 Walking the Royal Road: The Ancient Kingdom of Angkor. 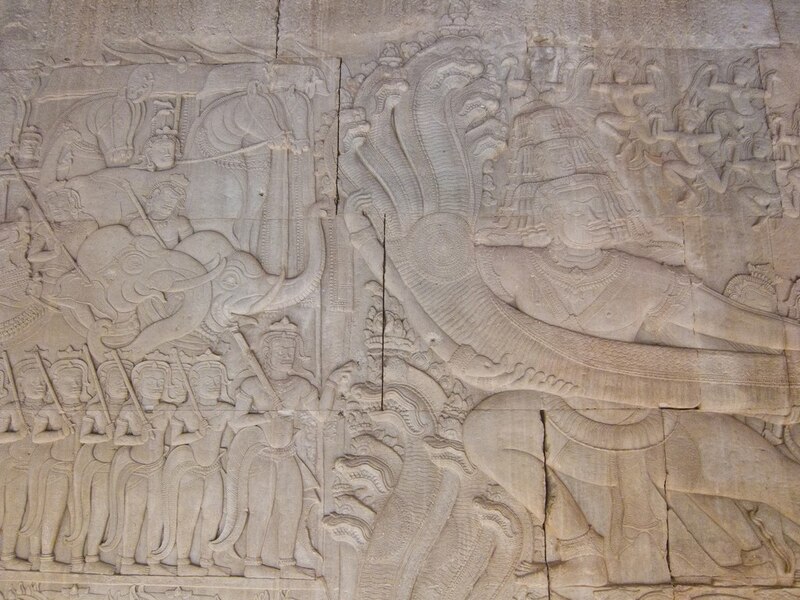 Dr. Jennifer Foley of the Virginia Museum of Fine Arts lectures on the ancient Southeast Asian kingdom of Angkor and the structures at Angkor Wat. Angkor Wat's rising series of five towers culminates in an impressive central tower that symbolizes mythical Mount Meru, surrounded by chains of mountains (the walls) and the cosmic ocean (the moat). Mount Meru is the home of the gods in Hinduism. 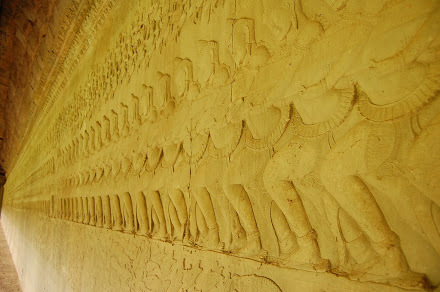 Thousands of meters of wall space are covered with stone carving depicting scenes from Hindu mythology. See a map with the galleries. On a 200 meters long and 12 meters wide sandstone-paved causeway you cross the 190 meters wide moats enclosing Angkor Wat. And you walk towards the west main gate with tower, called Gopura, which ist part of the 1025 by 802 meters external enclosure. This outer wall encloses a space of 820,000 square meters. The moats surrounding Angkor Wat are five and a half kilometers in their overall length. 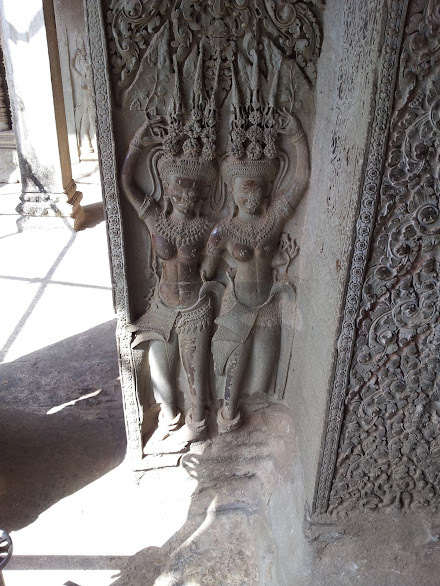 In the gallery inside the external enclosure you discover these stone carvings on top of a door. 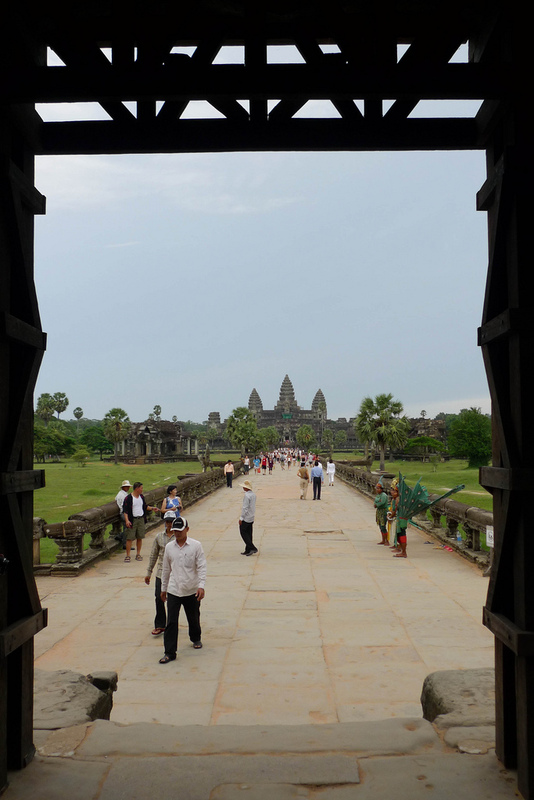 From the semi-darkness of the western gopura you get the looming perspective of Angkor Wat and its 350 meters long causeway, framed in the door. 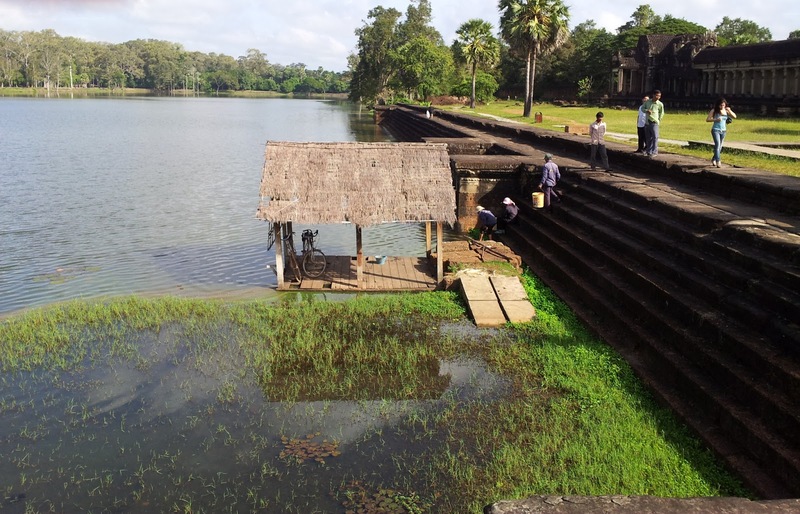 Don't miss this reflection in the northern pool: The temple of Angkor Wat,raised on a surrounding terrace with sugar palms and mango trees. Finally you arrive in front of the temple. It stands on a terrace and is made of three rectangular galleries rising to a central tower, each level higher than the last. 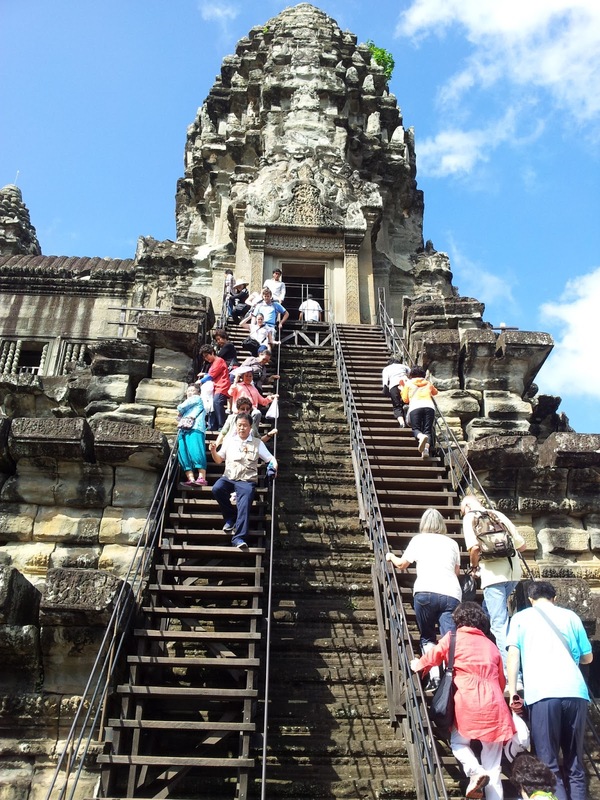 The height of Angkor Wat from the ground to the top of the central tower is 213 meters. The outer gallery measures 187 by 215 meters. And it contains the famous bas-reliefs of Angkor Wat showing epic events. If you begin on the western side and keep to your left you will see the following events: Battle of Kurukshetra, Army of Suryavarman II, Heaven & Hell, Churning of the Ocean of Milk, Vishnu Conquers the Demons, Krishna & the Demon King, Battle of the Gods & the Demons and Battle of Lanka (read more here). Angkor Wat during the spring equinox: Every year around 21 March, when the tilt of the Earth's axis is inclined neither away from nor towards the Sun and the center of the Sun is in the same plane as the Earth's equator, you can experience the astronomical knowledge of the builders of Angkor Wat. The temple aligns to the rising sun. On the morning of the spring equinox, the sun rises up the side of the central tower and crowns its pinnacle. Of course this gives room to many spiritual intrepretations, for example you can read Stones in the Sky by Willard Van De Bogart in 2003 or see the video Heaven's Mirror by Graham Hancock. 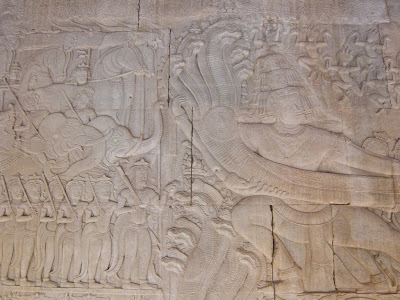 Eleanor Mannikka, of the Indiana University of Pennsylvania, argues in her work Angkor Wat: Time, Space and Kingship, that the dimensions, alignment and bas-reliefs of Angkor Wat encode a message that Suryavarman II was the divinely appointed king. 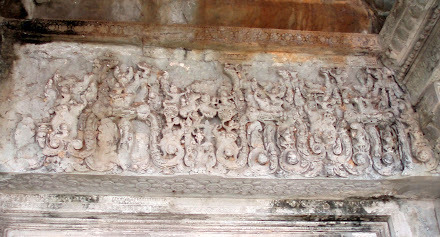 Read her text The Role of Astronomy at Angkor Wat. Here she writes: "On the morning of the vernal equinox day (roughly March 21st each year), once we have passed through the main western entrances and stand facing the interior grounds of the temple, we encounter a spectacular solar alignment. At 6:35 a.m., the sun can be seen rising dead-center over the top of the central tower of the temple - about 500 m. away - when observed from the top of the first northern staircase of the western causeway. Three days later, the sun can be seen rising over the central tower for the second and last time, from the center of the western causeway at a point just a few meters south of the first observation position." The website Treasure of the Ancient Khmer draws heavily from the book of Mannikka and has excellent maps of the temple and its galleries. 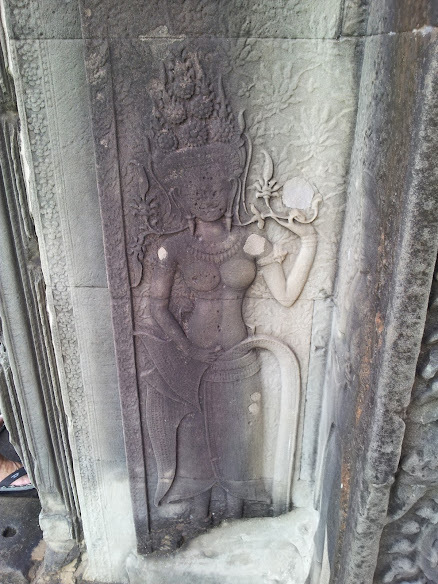 She points also to the bas-relief panel at the Eastern outer gallery, which shows the Hindu creation myth Churning the Sea of Milk. 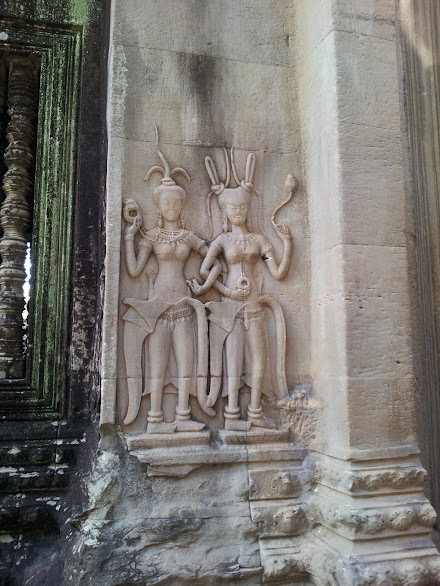 In the center is the serpent Vasuki, who offered himself as a rope. The serpent was yanked back and forth in a giant tug-of-war that lasted for a thousand years. 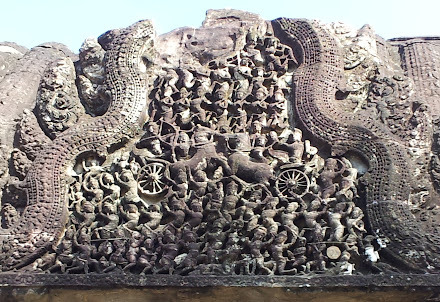 In the bas-relief panel, the front end of the serpent is being pulled by 91 asuras (demons), anchored by the 21-headed demon king Ravana; on the right are 88 almond-eyed devas (gods) pulling on the tail, anchored by monkey-god Sugriva. 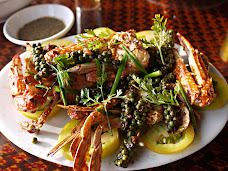 Mannikka says that the 91 asuras mark the 91 days between the winter solstice and spring equinox in March, while the 88 devas represent the 88 days to the summer solstice after the equinox period. 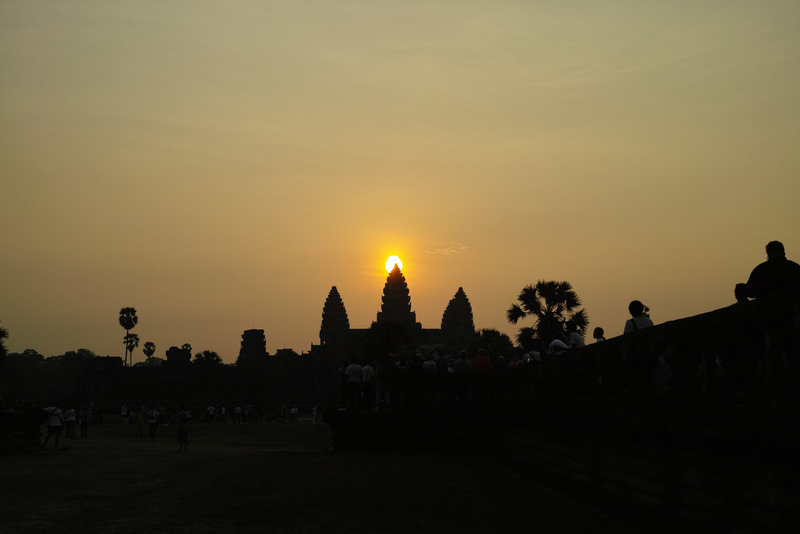 Read also Time, Space, and Astronomy in Angkor Wat by Subhash Kak. 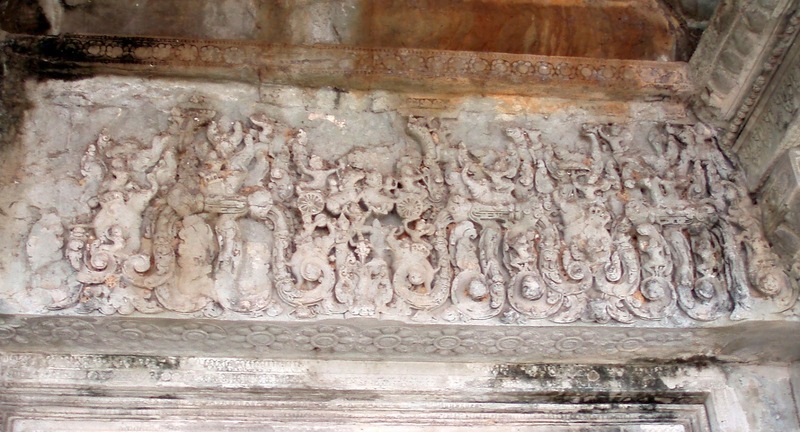 Bas-relief showing Churning the Sea of Milk: The god Bali, the king of the asuras, holds the heads of Vasuki on the south side of the relief. 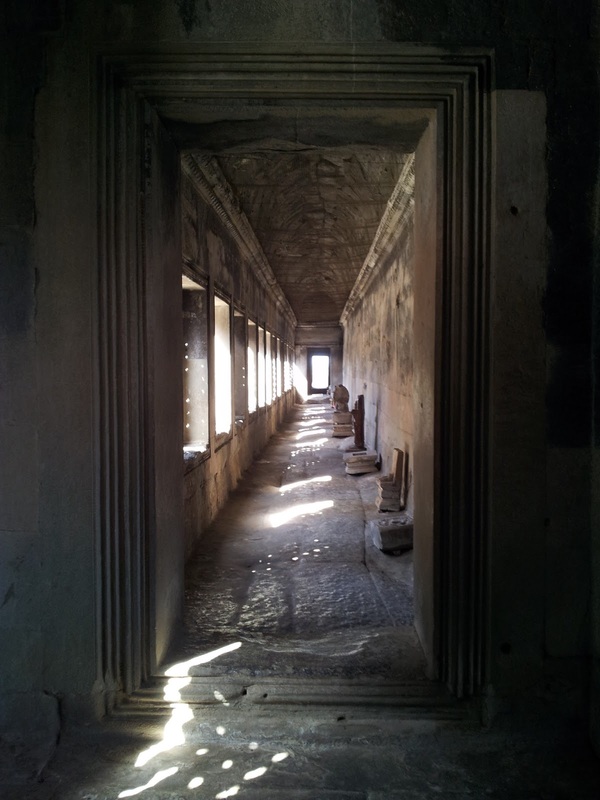 The right place to relax after walking across the causeway in the burning sun: A gallery of the cruciform cloister Preah Poan ("Hall of a Thousand Gods"). Buddha images were left here by pilgrims over the centuries, but most have now been removed. The cloister connects the outer gallery to the second enclosure. One of four stone basins in the cloister. As it is understood today the top level represented the heaven and served as a place for the king and royalty and high priests to worship to god Vishnu. The public was not allowed to come to this level. Twelve stairways lead up to the top level. Each one represents one year of the animal zodiac. Whoever climbed up had to know which stairway was good for his animal zodiac. From the gallery you look again into four basins, which surround the central tower. At the central shrine a golden statue of Vishnu was riding on Garuda's shoulders. But this holy statue has disappeared a long time ago. 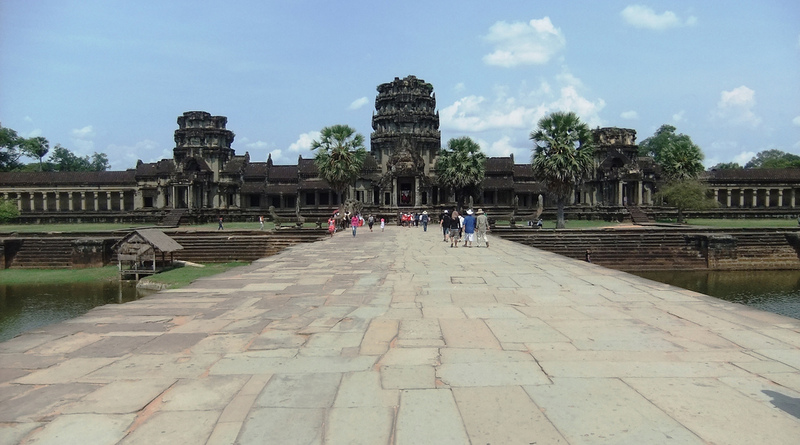 And how did Angkor decline? The great medieval settlement of Angkor in Cambodia has for many years been understood as a “hydraulic city,” an urban complex defined, sustained, and ultimately overwhelmed by a complex water management network. 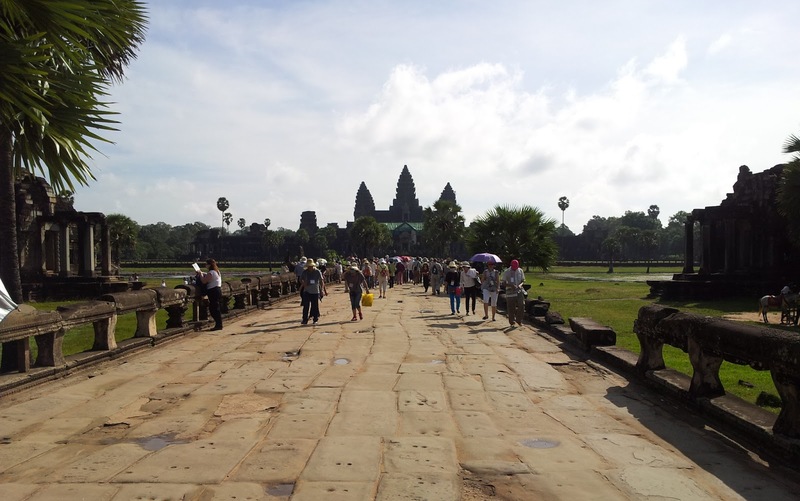 Since the 1990s, French, Australian, and Cambodian research teams have followed archaeological mapping projects by using traditional methods such as ground survey in conjunction with advanced radar remote-sensing applications. 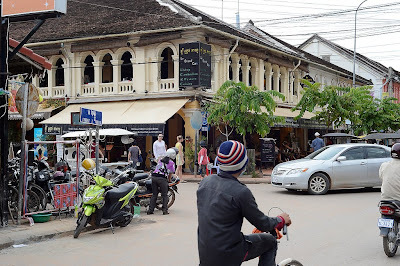 A major outcome of that research is a comprehensive archaeological map of greater Angkor, covering nearly 3,000 km2, prepared by the Greater Angkor Project (GAP), an international, multidisciplinary research programme interested in the decline of urbanism at Angkor. The map reveals a vast, low-density settlement landscape integrated by an elaborate water management network covering more than 1,000 km2, the most extensive urban complex of the preindustrial world. It is now clear that anthropogenic changes to the landscape were both extensive and substantial enough to have created grave challenges to the long-term viability of the settlement. 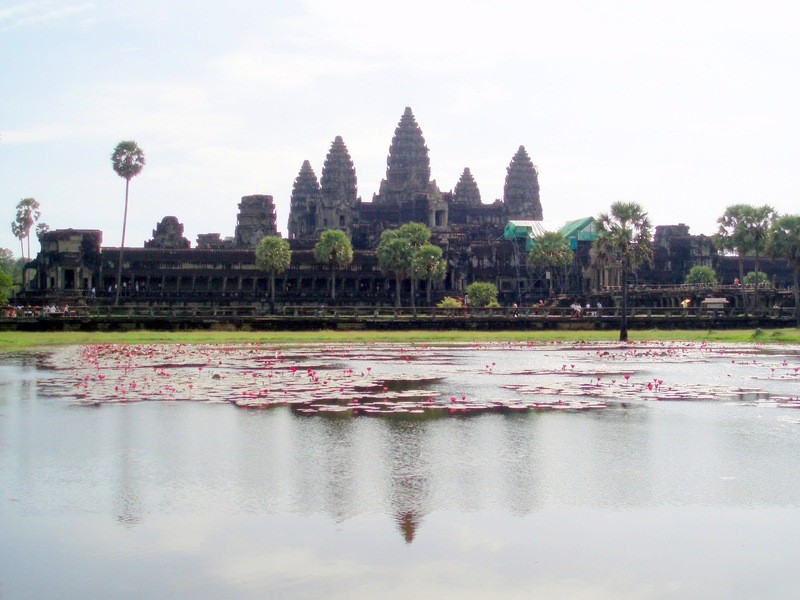 Read more: A comprehensive archaeological map of the world's largest preindustrial settlement complex at Angkor, Cambodia. 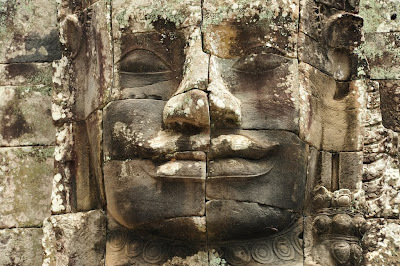 Divining Angkor: After rising to sublime heights, the sacred city may have engineered its own downfall by Richard Stone in National Geographic Magazine.